Wreck of the "Old 97"
This photo of the wreck of the "Old 97" was taken in neighboring Danville, Virginia. Danville is just under 2 hours south of famous Roanoke. The events of this accident are so widely known that there is a famous song about this train wreck. Gotta put her into Danville on time." You can see what a jump he made. Gonna see the Old '97 roll." He'd been scalded to death by steam. He'll leave you and never return. Mall Train Plunged from Seventy-foot Trestle. Washington Man and His little Son Among the Killed. Scene of Wreck Was Long Trestle Just North of Danville, Va.--Railroad Men Believe Accident Was Caused by the Breaking of a Flange on the Engine Wheel. Charlotte, N. C. Sept. 27.--While running thirty or thirty-five miles an hour, train No. 97, on the Virginia Midland branch of the Southern Railroad, jumped from a trestle seventy-five feet high, half a mile north of Danville, Va., this afternoon, and was almost demolished. The wrecked train was exclusively for mail and freight, consisting of four postal cars and one express car, and was southbound. Of the sixteen persons on the train, nine were killed and seven injured. Engineer J. A. BROADY, Saltsville, Va.
Fireman A. J. CLAPP, Greensboro, N. C.
Conductor J. BLAIR, Danville, Va.
Mail Clerk J. L. THOMPSON, Washington, D. C.
Mail Clerk S. CHAMBERS, Midland, Va.
Mail Clerk D. T. FLORY, Midland, Va.
Mail Clerk P. N. AUGENBRIGHT, Mount Clinton, Va.
Flagman J. S. MOODY, Son of Mail Clerk Thompson. Mail Clerks Louis W. Spiers, Manassas, Va.; Frank E. Brooks, Charlottesville, Va.; Percival Indemaurer, Washington; Charles E. Reames, Culpeper, Va.; Jennings J. Dunlap, Washington, D. C.; M. C. Maupin, Charlottesville, Va.; and J. Harrison Thompson, St. Luke, Va.
All of the injured men are seriously hurt and have been taken to the hospital in Danville. The recovery of Mail Clerk Spiers is not expected, and other clerks are thought to have received mortal injuries. The trestle where the accident occurred is 500 feet long and is located on a sharp curve. The engine had gone only about fifty feet on the trestle when it sprang from the track, carrying with it the four mail cars and an express car. The trestle, a wooden structure, also gave way for a space of fifty feet. At the foot of the trestle is a shallow stream with a rocky bottom. 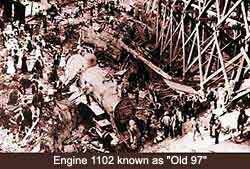 Striking this, the engine and cars were reduced to a mass of twisted iron and steel and pieces of splintered wood. As the cars went down they touched the sides of the Riverside Cotton Mill, which is very close to the trestle. All the men were killed instantly, it is thought, and all were greatly mutilated. The skin and hair of the engineer and firemen were torn off by the impact of the steam engine. Several thousand people were soon at the scene of the wreck. No one on any of the cars had made an effort to jump, and the bodies of all those killed were found in the wreckage of the different cars to which they belonged. Ladies who drove out to the wreck from Danville fainted at the sight of the bodies. It seemed miraculous that any one should have escaped, for each car falling with the engine bounded from it and completely collapsed after striking the rocks at the foot of the trestle. All the express in the express car was practically destroyed except six crates full of canary birds. None of the birds was hurt, though the crates were in the thickest of the debris. Unofficial opinion is that the cause of the wreck was the high speed of the train on the sharp curve. Railroad men believe a flange on the engine wheel broke. Train No. 97 was running about an hour behind time. The mail bags in all the mail cars were torn open and the letters and packages were scattered, but it is believed none is lost. Fire, which appeared in the wreckage shortly after it occurred, was quickly extinguished by the Danville fire department. On account of the wreck, all traffic on the central and northern divisions of the Southern will be delayed several hours. Arrangements are being made to run southbound trains over the Norfolk and Western from Lynchburg via Burkeville to Danville, which will cause delays of several hours. Official reports to the Southern Railway general offices in this city state that the wrecked train was on time at the last station at which she was reported and that it was going at the rate of thirty to thirty-five miles an hour when it approached the trestle and ran off the track just north of the trestle, carrying the trestle down when the engine ran off the tracks to the ground below. Broady, the dead engineer, was about fifty-five years of age, and had been with the Southern Railroad about twenty years, his service a large part of the time being on the division on which the accident occurred. While reports leave it in doubt just how the accident occurred, and it will take further inquiry to make this certain, it is believed here that the accident was due to a flange on the front wheel projecting over the rail and striking the ties. The trestle where the accident occurred will be fully repaired by an early hour this morning, and trains are expected to be running over it today. The injured men have been taken to the hospital at Danville and are being given every attention. Train No. 97, it is stated at the general offices, has been running about a year and has had no mishaps, except that some months ago it ran into some earth that had fallen on the track. John L. Thompson, of 12 Thirteenth Street Northeast, who was killed in the wreck, was thirty-six years old. He had been employed in the railway mail service for fifteen years, having entered upon the work while living at his old home, Roxbury N .C. In July last, he was not way promoted to a $1,500 position, and when on his first run in the appointment he was injured in the wreck at Springfield, on July 28, and was unable to work. He had returned to his work only a short time since. He married a Miss Price, of this city, about ten years ago, and then took up his residence in Washington. DEATH'S BLACK BLANK SWALLOWED UP NINE. A Mail Train on the Southern Plunges Over a Trestle. DUE TO A BROKEN FLANGE? North Carolinians Among the Dead--The Disaster Near Danville. While running thirty or thirty-five miles an hour train No. 97. on the Virginia Midland branch of the Southern Railroad, jumped from a trestle seventy-five feet high, half a mile north of Danville, Va. this afternoon, and was almost demolished. Engineer J. A. BROADY, Saltsville, Virginia. Fireman A. J. CLAPP, Gibsonville, N. C.
Conductor R J. BLAIR, Spencer, N. C.
Mail clerk D. T. FLORY, Midland, Virginia. Mail clerk P. N. AUGENBRIGHT Mount Clinton, Va.
Flagman J. S. MOODY, Raleigh, N. C.
Fireman JOHN HODGE, Raleigh, N. C.
The injured are--Mail Clerks: Louis W. Spiets, Manassas, Va.; Frank E. Brooks, Charlottesville, Va.; Percival Indemaurer, Washington; Charles E. Reames, Culpeper, Va.; Jennings J. Dunlap, Washington, D. C.; M. C. Maupin, Charlottesville, Va., and J. Harrison Thompson, St. Luke, Va. The trestle where the accident occurred is 500 feet long and is located on a sharp curve. The engine had gone only about fifty feet on the trestle when it sprang from the track carrying with it four mail cars and an express car. The trestle, a wooden structure, also gave way for a space of fifty feet. All the men were killed instantly, it is thought, and all were greatly mutilated. The skin and hair on the engineer and firemen were torn off by the impact of the steam engine. Several thousand people were soon at the scene of the wreck. No one on any of the cars had made an effort to jump and the bodies of all those killed were found in the wreckage of the different cars to which they belonged. Ladies who drove out to the wreck from Danville fainted at the sight of the bodies. 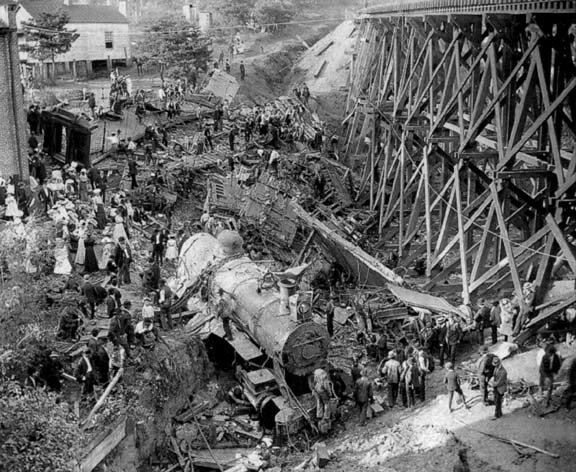 It seemed miraculous that any one should have escaped, for each car falling with the engine bounded from it and completely collapsed after striking the rocks at the foot at the trestle. All the express in the express car was practically destroyed except six crates full of canary birds. None of the birds were hurt, though the crates were in the thickest of the debris. On account of the wreck, all traffic on the central and northern divisions of the Southern will be delayed several hours. Arrangements are being made to run southbound trains over the Norfolk and Western from Lynchburg via Burkeville to Danville, which will cause delays of several hours. Official reports to the Southern Railway general offices in this city state that the wrecked train was on time at the last station at which she was reported, and that it was going at the rate of thirty to thirty-five miles an hour when it approached the trestle and ran off the track just north of the trestle, carrying the trestle down when the engine ran off the tracks to the ground below. The injured men have been taken to the hospital at Danville and are being given every attention. Train No. 97, it is stated at the general office, has been running about a year and has had no mishaps, except that some months ago it ran into some earth that had fallen on the track. John L. Thompson, of 12 Thirteenth Street Northwest, who was killed in the wreck, was thirty-six years old. He had been employed in the railway mail service for fifteen years, having entered upon the work while at his old home, Roxboro. N. C. In July last he was promoted to a $1,500 position, and when on his first run in the new appointment he was injured in the wreck at Springfield on July 28 and was unable to work. He had returned to his work only a short time since. He married a Miss Price, of this city, about ten years ago and then took up his residence in Washington. "The train consisted of two Postal cars, one express car and one baggage car for the storage of mail. The trestle is very little damaged as the train jumped the track about forty feet north of the trestle on sound track, good line and surface and proper gauge. The trestle was in first class condition and was so well braced that the engine and train falling on the outside of the curve knocked down the outside post and left the others standing. Eye witness reports that the train was approaching the trestle at the rate of speed of thirty to thirty-five mile per hour. The loss of life and personal injuries are very much regretted. "The cause of the accident is being investigated. The trestle was promptly repaired and the first train passed over at 9:10 this a.m."
Salisbury N. C. Sept. 28--The body of Conductor J. T. Blair who was killed in the wreck of No. 97, the fast mail at Danville, Va., Sunday afternoon, was brought to his home at Spencer at 3 o'clock this afternoon. The funeral services were held at once and the interment was in the cemetery near Spencer. Fireman A. G. Clapp, of Spencer, who was killed in the same wreck, was buried this afternoon at Gibsonville N. C. with I. O. O. F. honors. About fifteen members of Spencer lodge of this order attended the funeral which was held at Gibsonville, the home of the deceased. Mr. Clapp was highly esteemed by all who knew him and was a member of the Presbyterian church. He carried $3,000 life insurance in the Railway Brotherhood. Engineer Broady, who was killed at the same time, had recently moved to Spencer to live having been transferred from Cumberland. Md. This was his first run on the fast mail. He was buried at Saltville. Va., his native place.